Before you can gather around the Christmas tree and enjoy the holiday spirit, it’s necessary to get the tree home from the lot. Unless they deliver, you’ll find it necessary to transport the tree in your car. Rather than having a Grinch experience that results in damage when attaching a tree to your car, keep the following tree hauling tips in mind. Plan ahead. Prepare before attaching a tree to your car by gathering necessary items. You will need blankets, tarps or plastic sheeting to protect the interior and exterior of your car from sap and needles. A blanket placed between your tree and the roof of the car can prevent scratching. In order to secure the tree to your car, bring rope, bungee cording or straps that are soft enough not to scratch your car’s surface. Protect your auto with a car wax. Prior to transporting your tree, it’s a good idea to get a car wax. A high-quality waxing will provide a buffer between your car and the tree and hauling materials. Wax provides a valuable layer of protection. Consider size. 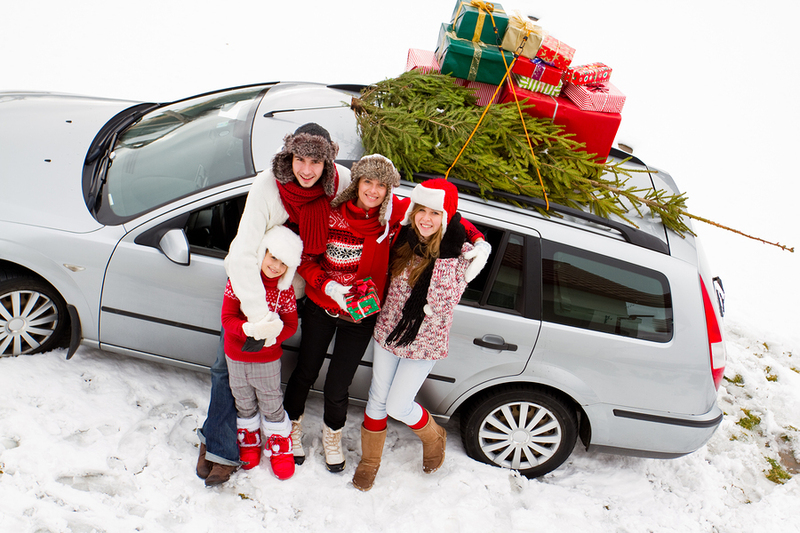 Aim for buying a Christmas tree that will fit inside of your vehicle or on your car’s roof rack, if you have one. The smaller the tree, generally the easier it will be to transport without damaging your car. Have your tree netted. If the service is available, have the tree netted before leaving the lot. This provides an added layer of protection between the tree and your auto and helps to preserve the tree. Netted trees are also less likely to sustain damage to the limbs and lose fewer needles during transport. Secure the tree well and in the right direction. Avoid wind damage to your tree by attaching it to your car so that the stump end faces the front of your vehicle. When you drive, the wind will push the limbs and needles in the tree’s natural direction of growth. Before leaving the Christmas tree lot, tug on your tree to make certain it is secure. If you inadequately attach a tree to your car, you risk creating dangerous debris while driving. According to the AAA Foundation for Traffic Safety, more than 200,000 auto crashes occurred between 2011 and 2014 because of debris on U.S. roads. This resulted in about 39,000 injuries and more than 500 deaths. Drive home slowly, and avoid the highway or freeway. Have your car cleaned promptly. Ensure that troublesome staining from sap is removed and stray needles are vacuumed up as soon as possible after hauling your Christmas tree home. The sooner you have your car detailed, the less long-lasting damage your auto is likely to sustain. Click here for valuable discounts on car detailing.